Here's the problem with plants: they require dirt which is, well, dirty. Japanese researchers at Mebiol have figured out a way to grow small crops of Earthly flora on clean sheets of hydrogel (commonly found in diapers), called Imec, that measures just tens of microns thick. 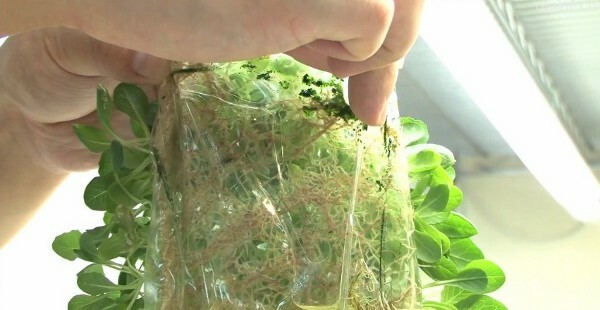 Roots grow along the membrane, absorbing water through it, but the material is able to block out bacteria and viruses that could harm the plants. Of course, there are downsides. Water is absorbed at a much lower rate through the gel than with traditional soil, so plant size is limited and only the strongest and healthiest varieties can truly thrive on the flexible sheets. By using carefully selected plants and high quality fertilizer though, researchers were able to grow tomatoes, spinach and even melons, and hope to strengthen the film enough to support trees. Not bad for a substance normally used to absorb baby pee. Check out the video after the break. Researchers grow crops on super thin film, do away with that pesky soil stuff originally appeared on Engadget on Wed, 17 Aug 2011 13:47:00 EDT. Please see our terms for use of feeds.